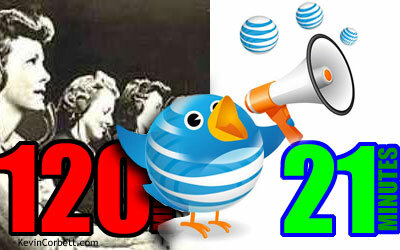 That’s the difference in time between Telephone and Twitter, in getting a resolution from AT&T Customer Service. After sitting and waiting on hold and being transferred to SIX different departments, and sitting at my computer–waiting on hold most of the time, I took to Twitter. 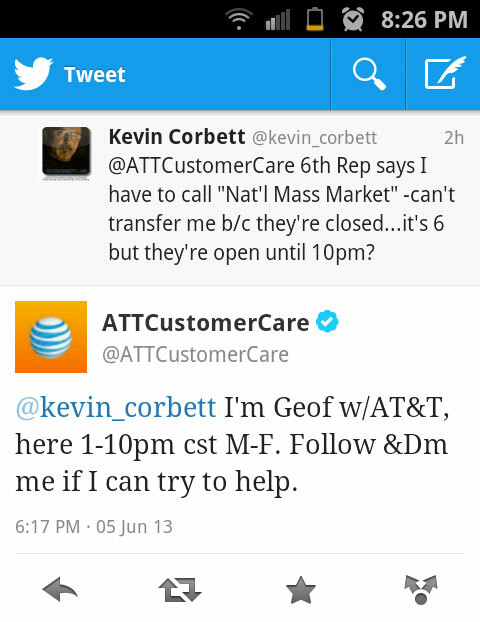 As much as a way to pass the time, I was curious to see if I could get a response from AT&T using social media. The problem was simple enough but somewhat convoluted. Nearly 15 years ago, when getting dial-up Internet as part of my residential service, I also acquired an att.net email address. Over the course of years, services changed, the home phone was discontinued in favor of cell phones and neighborhood broadband carriers changed twice. It was my primary email and I had it forwarded to another account as uses changed over the years. AT&T no longer supported the email and it is currently handled by Yahoo! I had recently received emails from AT&T announcing changes coming June 10th, and to consider an upgrade. When I tried to log-in, I found I had forgotten the password and it was not retrievable using old security questions that were vague enough 15 years ago that I didn’t remember the answers. The problem then, was verifying I was who I was. I appreciate how difficult it is to get a lost password via phone and appreciate AT&T’s security protocols. Unfortunately, what I experienced was “security by obscurity”. I had already talked to six different people. One of the most helpful was the fifth person I talked to: Amy Sullivan (AT&T employee number A5604C). She was the only one that truly listened and attempted to solve the problem, orchestrate and enlist others who could do so and conducted a group conversation with someone she felt could solve my problem. Eager, upbeat and positive, Amy was confident when she transferred me to Rayne, that the problem was solved. Unfortunately after dropping the call and calling me back, Rayne read from her script and we walked through all of the things again that were explained to her in the conference call. Rayne said she had to forward me to the “National Mass Market” for my state, as they were the only people who could assist. She asked me to hold, then returned saying they had closed for the day but I could call during business hours which were from 7am to 10pm. I pointed out it was only 7pm, and she couldn’t account for why they weren’t answering. Through DM he asked me a couple questions, then he called me. After putting me on hold for only a few minutes, he returned with a reset password and waited while I quickly accessed the account and logged-in. BOOM! Problem Solved. Impressively, his assistance and final solution came after his work day was supposed to have ended in his Central Daylight Time location. Geof put-in some over-time to help me. Awesome. On one hand, Social media gives individuals the capability to be heard. On the other hand, it gives responsible brands the opportunity to provide personalized service. AT&T was responsive and impressively, one person had the power and ability to connect with me and quickly solve my problem. Consider one social media person (Geof) skillfully handled a problem in only twenty-one minutes that six different people couldn’t handle in the span of over two hours. I’ve been a long-time customer of AT&T. I bought my first cell phone from them and have been a long time customer for a number of their services. And, while I was frustrated and upset over the laborious two hours of time spent on the phone today, I’m really impressed and thankful for the outstanding service I received from the AT&T Social Media Department–a model for other individuals and companies looking to provide exemplary customer service and responsiveness. What positive experiences have YOU had with big companies over social media–I’m curious, please share them in the comment section below. DISCLAIMER: I don’t know that it needs to be said but, in case you’re curious: This post is NOT a paid testimonial and is a reflection of today’s experience only. My thoughts are mine (or so I like to think!) Otherwise, all copyrights apply.